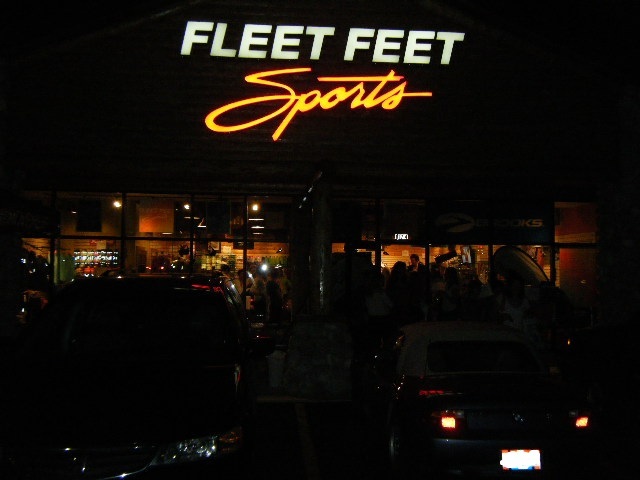 Last week Fleet Feet, a running store up in Westerville, held its Diva Night. It was pretty awesome. A night dedicated to pampering women with massages, brow waxing, wine, cupcakes, arts and crafts, and sales. If you’ve never been there, it’s kind of a small store that is usually jam packed with racks of athletic wear and can be sorta hard to maneuver around in if it’s busy. Last night, they had moved almost all of those racks out of the store front to make room for the festivities. Which was a good thing, since there were so many women there, it was still hard to walk around. That’s ok though, it made it easier to make new friends! Like the woman I met over the water bottles that were slightly pushed under a table, and we debated whether or not they were up for grabs, and we decided that they must be, and if not, then we would get in trouble together, cause trouble is more fun that way. Or Stephanie, who I met in line for the eye brow waxing (which, sadly, we did not get to partake in, as they had to stop because of the fashion show), and we talked about the running programs that Fleet Feet offers, No Boundaries and MIT. Stephanie runs with MIT, and I want to run with MIT to train for a half marathon next year. She was super nice, and she will be running her first marathon this weekend! There were several giveaways over the course of the evening (of which I won exactly none), and free wine (from a local winery, Eldchrist Wine) and mini-cupcakes (from Baby Cakes Bakery). They also gave everyone a little gift bag when you first walked in. All of the staff were on hand to help with your shopping needs, shoe fittings, bra fittings, whatever you were looking for. It was kinda cute because all of the men who work there were dressed up in suits, which gave it a little classier feel. Except for the one guy who was wearing white socks with his dress shoes, and the other guy that was wearing sandals. But, you know, whatever. My favorite part was the arts and crafts time just outside the store. 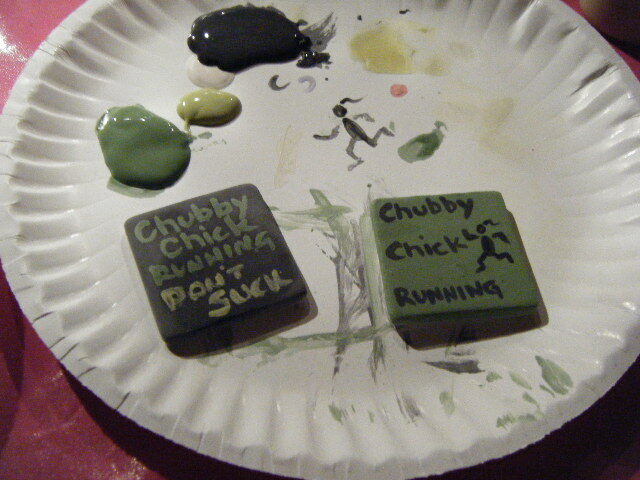 Sponsored by Marcy’s Clayground (awesome, I know), you could glaze your own little magnet. There were little clay squares and a variety of colors. You could paint anything you wanted on it, she would take it and fire it, and will be bringing it back to Fleet Feet for us to pick up. I love arts and crafts time. I probably spent a good 45 minutes out there trying to get it just right. Apparently, you're supposed to layer from light to dark. Whoops..., but she was nice enough to let me have another go at it. Honestly, it was a lot more fun than I thought it was going to be. I went by myself on a whim after work, but I still had a lot of fun. You never know who you’re going to meet, or what you’re going to find unless you go for an adventure every now and then. 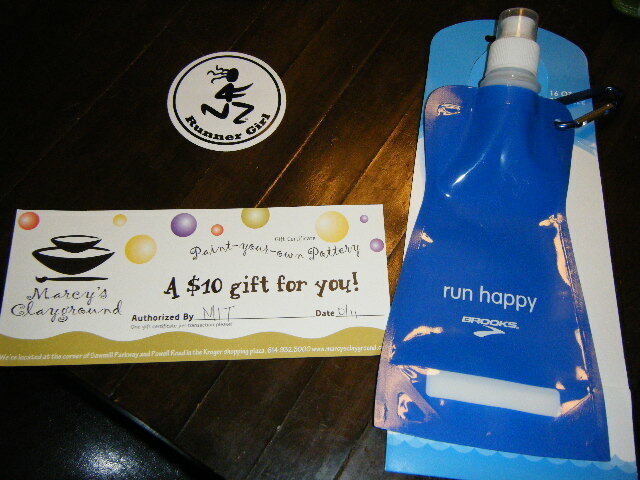 This entry was posted in Accessories, Life at Large and tagged Diva, Fleet Feet, Marcy's Clayground, MIT, shopping.